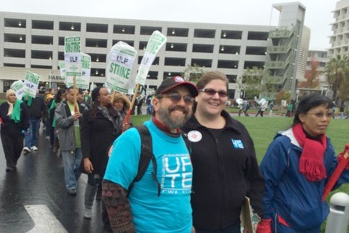 UPTE bargaining teams are back at the table with UC this week, after union leaders reported an encouraging high-level meeting with new UC president Janet Napolitano last month, in which she supported the principles of a single-tier pension and fair raises for researchers, techs and health care professionals. Details of the meeting, along with some of the comments employees wrote to Napolitano, appear in the latest UPTE Update. When UC service and patient care workers represented by AFSCME 3299 went on a one-day strike on Nov. 20 over UC’s unfair labor practices, they were joined in a sympathy strike by 15,000 graduate student employees. They were not joined, however, by a young UC Berkeley mathematics lecturer, Alexander Coward, who wrote urging his undergraduate students to scab on the strike and cross the picket lines. His letter was circulated by the university. A strengthening economic recovery and the passage last year of Proposition 30 are leading to surpluses in the state budget that some projections estimate will reach $10 billion within five years, as KPFA Radio’s Evening News reported. Pressure on Sacramento to restore funding for severely cut social welfare and education programs is expected to grow, and UC’s president has joined the call to increase funds allocated to the university. But the Sacramento Bee is leading the charge against using public money to pay for UC’s pension liabilities, in an editorial filled with misconceptions. Take a moment to respond with a letter to the editor here. The Center for Economic Development has issued a report concluding that California is losing its position as a national leader in higher education. The percentage of young adults earning degrees in California is already below the national average, the report found, which called for the state college system to work more closely with for-profit private colleges, employers, and the schools. While some shopped this past “black Friday” weekend, others stood up for their rights as workers. Fifteen hundred WalMart workers and their supporters picketed coast-to-coast for an end to management retaliation and a living wage. Other people marked the date as “Buy Nothing Day,” a 20-year-long tradition against consumerism that began in Canada.